Tourist Map of Har ki Dun Trek in Uttarakhand. Handcrafted detailed tourist map, route map, road map of Har ki Dun Trek. Har ki Dun Trek Map shows all the tourist attractions and places to see in Har ki Dun Trek with their distances and direction. Disclaimer: Map Not to Scale - for illustration purpose only. To be used as a reference while you are traveling to Har ki Dun Trek. 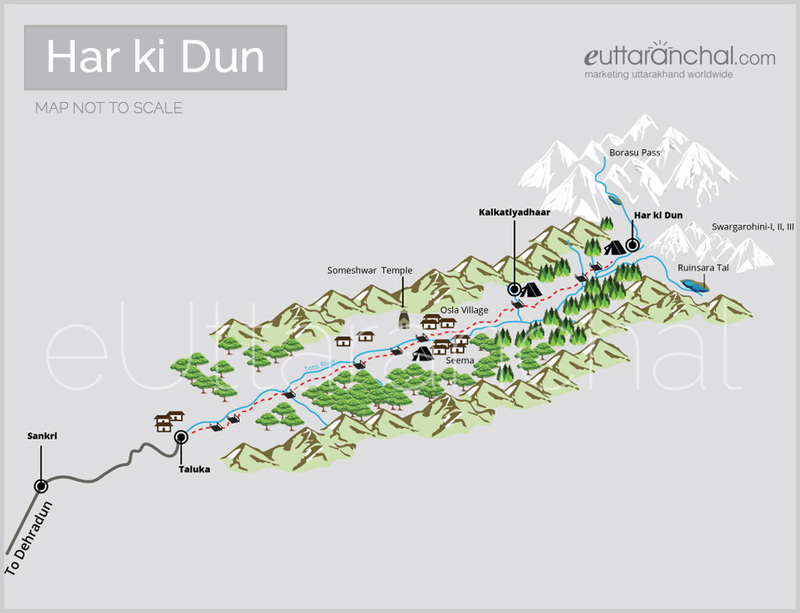 Team eUttaranchal has done all the efforts to make this tourist map of Har ki Dun Trek as accurate as possible. However, eUttaranchal does not own any responsibility for the correctness or authenticity of the same.